It may come as a surprise but I rarely have time to browse bookstores anymore. It's down to maybe once a month now and when I do, I rarely buy anything. Call it being poor, or having a massive TBR list or requesting lots from the library, but my buying habit has dried up a bit. Even though rare, i still love to browse, coffee in hand and a pen and paper in the other. I stumbled across this book at a Barnes and Noble while hanging with a friend (who bought 8 books that day so she made up for me!). It was on the new fiction display and admittedly the picture of the little kid holding the adult's hand caught my eye! Seeing that it was about adoption I immediately thought, "this is a book I should read". I have a few friends who have gone through the adoption process and some that are still waiting. The topic is one that fascinates me. This book was not a lengthy time consumer for me but it was heavy in it's material. I had to put it down a few times because the emotions were so raw and I felt I needed a little processing time. Chloe Pinter is the director the Chosen Child's domestic adoption program. She has brought families together working with many biological and adoptive parents. Though stressful, she loves her job and works hard for her clients. 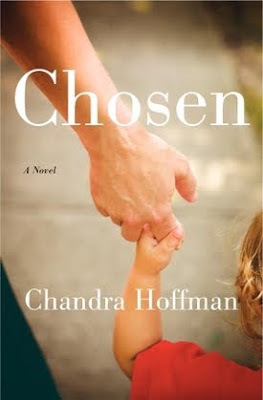 Chosen centers around not only Chloe but the lives of three of her clients. The Novas are a well off couple who after years of working with Chloe they get pregnant on their own. Delighted to be parents finally, they come to struggle with the demands on their marriage. The McAdoos are another couple, who have tried everything to become parents and after several unsuccessful adoption attempts, seem to have found the one. Frannie McAdoo is anxious, tenacious and vigilant about becoming a mother. She writes frantically on the message boards for adopted families hoping to finally have that story to tell, sharing the "Yes, we have a baby!" moment. Her husband John quietly stands quietly behind his wife and harbors a devastating secret. And then we have Jason and Penny and the baby that is meant to be for the McAdoos. They are young, poor, uneducated, drug addicted ready to take any scrap they get; money, food, a way out. Their intersecting stories play out a dramatic tale of hope and horror; loss and gain; anxiety and fear; right and wrong. Like I said above, I had to put this one down a few times. Having a child, I could feel the desire in some of these characters in their anxiety to start a family. I could feel their frustration when they knew they had to completely leave it in the hands of strangers. I felt the immense anger at those who could easily conceive a child and then recklessly care for it and themselves. The Author's note in the end summarizes that she did not want to paint a portrait of black and white, hero or villain but show the many sides of gray that the world of adoption creates. This is her first novel and I would say she is off to a good start. Her past experience includes that of a director of a US Adoption program in Portland and you can see that she is very familiar with the politics behind it all. Because of its graphic nature and emotional story lines, I would rate this at a 4: Recommended but with caution. It combines a fair amount of a thriller/suspense feel with that of a solid novel. It will get you thinking about your role as a parent and what lengths you would go to for a child. I just had a lengthy conversation about the adoption process with my husband tonight over dinner so I think Book Clubs would have a fair amount to discuss. It brings up questions about so many things; what defines the role of a parent, the politics of "baby buying", and the financial investment of children. I was curious about this one! Sounds like it brings up a lot of interesting issues! Adoption has always fascinated me so I might enjoy this one! Thanks for the great review! I have this one on my Kindle now but just haven't had a chance to read it yet. I'm glad I got to meet you at dinner last weekend! While this book would definitely foster some good discussion, it's not one I would hand to a couple contemplating adoption for the first time. It would scare them to death! I think SOME of Hoffman's points about adoption are very well taken, but the situation she describes is a VERY unlikely one. Readers have to remember that Hoffman is writing a thriller/suspense kind of book - it's not necessarily an accurate portrayal of the adoption process.